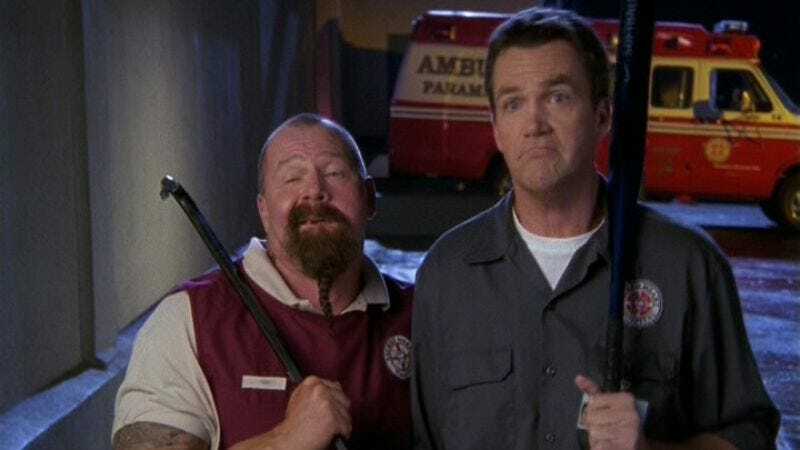 Dr. Cox has always been of another generation than the primary protagonists of Scrubs. While Turk, J.D. and Elliot are all united by their status as second-year residents, Cox is at a different point in his professional career, and in previous seasons has been equally distinct in his personal life. Managing a complicated relationship with his ex-wife is not the same as the nascent romances of his young charges, and as a result the show has treated the character differently. Heck, I always find it interesting—I know at least one person thought it annoying last year—how I almost always refer to him as Dr. Cox in these reviews, even though it would probably be more logical to refer to him as Perry; it places him in the same category as Kelso, in that the use of the last name establishes his distinct place within the hierarchies of Sacred Heart and thus also of Scrubs itself. “My White Whale” is one of the first episodes I can remember where the series places Perry on a level playing field with the residents. Baby Jack’s persistent cough becomes a source of insecurity for Perry, who enters into a petty—and enjoyable—war with the hospital’s best pediatrician Dr. Norris (Christopher Meloni) over his son’s care. The episode is a reminder that when you’re a first-time parent you’re not unlike an intern, in that all the knowledge you could possibly have won’t prepare you for the first time that something looks like it could go wrong. When Jack starts coughing, Perry can’t imagine being the kind of parent who freaks out over a little cough; when he keeps coughing, he’s the kind of parent who rushes into the hospital and interrupts another patient’s exam to have his baby examined. Perry has always shown a juvenile side that can emerge during certain circumstances, but here it’s nicely calibrated as a distinctly emotional response to a crisis. His puppet kidnapping is broad and playful, bouncing off a really enjoyable performance from Meloni, but it’s also a nice representation of the lengths he’s willing to go to protect his son. While the episode ends with some fairly pat conclusions to the episode’s other storylines, that Jack is still coughing is not a sign that the baby’s about to die—this isn’t a soap opera—but rather a reminder that the anxiety Perry and Jordan felt in this moment isn’t going to disappear any time soon. This is their new life, their experience as parents more or less the same as what interns feel when nothing they can do will ever remove every single bit of anxiety from their day-to-day lives. We get further reminders of that from the rest of “My White Whale,” which mostly spins off of the residents’ new sets of interns. It’s not shocking to see that the characters’ interns are mainly ciphers through which their own anxieties can be worked out, whether it’s J.D. trying to be too much of a buddy or Elliot’s own issues with Dr. Kelso being transferred down to beatboxing Bruce. The former storyline becomes an avenue into J.D.’s continued jealousy of Sean’s relationship with Elliot—more on that below—while the latter gives Elliot a chance to fight off her own white whale—Kelso—on behalf of her intern, but they end up feeling like minor storylines compared to Perry’s. I’d also argue that this is a case where Turk and Carla almost steal the episode without a storyline, the former’s fake storm-off and the latter’s “meddler’s high” earning the largest laughs of the episode. The beatboxing conclusion might be a bit cute in how it works with the convergences, but the episode earned that convergence with characters like Turk and Carla floating between the storylines effectively. The parity between Dr. Cox and the rest of the show’s cast is tested in “My Lucky Night,” one of the Zucker-era super-sized episodes that must introduce and resolve a number of central conflicts as a transition point into the rest of the season. This becomes clearest toward the end of the episode, when a chained voiceover links the characters’ varied plights together. While J.D.’s voiceover is often used to reframe a range of storylines within a central theme, here that tool expands beyond its inherent writerliness to a reminder that the storylines introduced in the episode really have managed to touch every character distinctly. The episode begins and ends with the season’s first big development, which fully pushes the aforementioned Elliot/J.D./Sean triangle into the limelight. The beginning of the episode serves as a reminder that it was never really as much of a triangle for Sean as it was for us: Somehow, the fact that Elliot and J.D. have slept together never managed to reach Sean, which combined with his secret plans to leave on a six-month trip to New Zealand creates a sudden crisis in a relationship that in the previous episode looked fairly stable. The result is a mad scramble in which J.D.’s interest in Elliot continues to percolate—as it did in “My White Whale” with the tension as Sean tries to help J.D. while knowing said tension is really about J.D.’s feelings for Elliot—and Elliot and Sean’s relationship reaches a key turning point. The storyline ends, however, as though J.D. was never even a part of it: it’s just his phone message that raises Sean’s anxiety and pushes him to suggest they don’t bother with long distance, while J.D. never makes it to Elliot’s apartment until after they’ve independently chosen to make it work before Elliot gets to hear how J.D. feels about her. How does he feel about her, though? J.D. says himself during the chained voiceover that he’s once again only interested in Elliot when she’s in a relationship with someone else, but why other than for the powers of romantic inertia does he want to be in a relationship with her? Equal parts jealous and selfish over the course of these two episodes, I found it hard to sympathize with J.D.’s plight. Some of this might be hindsight knowing how this relationship evolves—and devolves and evolves again—over the course of the seasons to come, but J.D.’s frantic run to be by Elliot’s side after getting the night off from Dr. Cox definitely doesn’t feel like a triumphant moment dashed by happenstance. Rather, it feels like J.D. is so far in his own head that he never stops to realize that this wasn’t the universe spurning him but rather Elliot making an impassioned, honest decision and working with Sean to try to make something work. Perhaps we’re meant to believe that if Elliot only knew J.D. still cared about her she’d make a different decision, but would she really? Scrubs knows how to make a “moment” like J.D. running after Elliot, the indie rock swelling as J.D. prepares for triumph and ends up defeated, the camera lingering on his slow walk away from Elliot’s apartment. But “My Lucky Night” often works better in its small moments, like Turk proving incapable of singing along to his own Aaron Neville recording or the Janitor and Troy’s struggle to solve J.D.’s riddle, which I discovered was one of the most memorable Janitor runners from the series’ run given how much of it I had committed to memory. By comparison, while I remember the broad strokes of J.D.’s relationship with Elliot, I largely blank on details, hindsight rendering their “Will They, Won’t They” not a waste of time so much as a collection of events my mind has blurred together lest I focus too heavily on—in this case—J.D.’s jealousy masquerading as true love. Whereas Turk and Carla’s navigation of pride focuses on the foundation of their relationship, and Perry’s willingness to let Jordan help him become residency director shows the character maturing into his new role as a father, J.D.’s own prideful display is less a solid foundation for future development and more a warning sign for a character trait that will prove all-too foundational in later seasons. In covering MTV’s Awkward., another show with a voiceover and a close focus on the perspective of its protagonist, I’ve talked a lot about its impact on storytelling and wonder to what degree being in J.D.’s head becomes a liability with a storyline like his feud with Sean—if you’re not wholly with J.D. on Sean, the rather vindictive nature of his fantasies can turn you against the character pretty quickly in a way that their real-life interactions might not (although his exaggerated yawn is a douche move either way). Meloni’s guest appearance is likely to be a footnote for the midseason debut of one of Lawrence’s three new projects next season, FOX’s Surviving Jack—I had forgotten that this foreshadowed that casting, and was reminded that although the Mr. Cookie Pants material is broad McGinley and Meloni played off each other well. Although Christa Miller remains far from a “central” cast member, the focus on Perry here means a more consistent presence for Jordan, which is welcome. “I’m so proud I could poo” was a particularly enjoyable line I had more of a memory of than I realized. For anyone concerned about “New Elliot” proving too normal, there’s some fun scatteredness in “My White Whale” particularly, like how she threw out a rum raisin muffin because alcoholism runs in her family. A throwaway joke, but one Chalke nails. I had forgotten about Perry’s singing of “Tiffani Amber Thiesen,” which will reshape how I watch the White Collar credits for a few months (if I were still watching White Collar). Next Week: Brothers and sister make Scrubs a family affair.